Tesserae from the mosaic on the front of the San Giovenale chapel inside the Narni Cathedral were analyzed through non-destructive XRF analysis for the characterization of both colouring matters and opacifiers of the glass matrix. Subsequently, the concentration of the elements present at trace levels (μg g-1) was determined by means of Instrumental Neutron Activation Analysis (INAA) for comparisons with obsidians of known provenance and well-studied micro-elemental composition, in order to identify the geographical origin of the obsidian used in this Middle Ages mosaic. The main result is that the black tesserae were made with obsidian fragments coming from the Sardinia deposits (probably, Arci Mountain site C). On the façade of the Oratory of San Giovenale, which is located in the Cathedral of Narni (Central Italy), is a mosaic depicting the Majestas Christi (Christ in Majesty) (Figure 1), in which the figure of Christ is inserted into a circular mandorla flanked by saints. This Majestas is considered one of the oldest Medieval wall mosaics of Central Italy, with the exception of those of Rome. During the Middle Ages, in Central Italy, above all in Tuscany, wall mosaics were relatively numerous in the 13th and 14th centuries. On the contrary, we have no knowledge of previous wall mosaics dating from the 10th and 11th centuries. 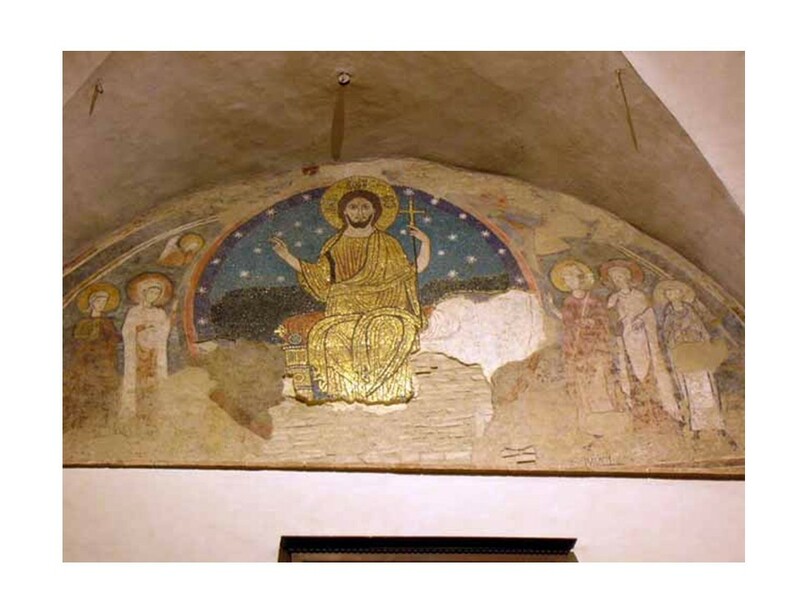 For these reasons, the mosaic of Narni Majestas is an early example of the revival of the mosaic and the new interest in it in the 12th century whose use had long been neglected in great as in small art centres of Italy. In fact, the last wall mosaic prior to the 12th century is located in Rome which dates back to the middle of the 9th century. Mosaic depicting the Majestas Christi (Christ in Majesty) on the entrance of San Giovenale Chapel inside the Cathedral of Narni (Umbria, Italy). The location of the Narni mosaic back slightly hidden and difficult to access, has undoubtedly contributed to preserve the work in the interventions that changed the decoration of the interior walls of the cathedral. The obsidian, natural glass from volcanic origin formed by rapid solidification from a liquid state (SiO2 as main component ranging between 66% and 75%) , has been widely employed for hand-manufactured goods both in the Middle East and the Mediterranean area since long time. Obsidian is widely considered an ideal material for source tracing using elemental methods of analysis. The literature of the past two decades includes a number of papers which discuss the nature of production, trade and exchange, and review the history of their archaeological interpretation . Trade is defined in the archaeological record as the movement of the materials themselves, not their ownership or possession. In order for a provenance study to be successful, there are several prerequisites: 1) all relevant geological sources should be known; 2) these sources must be characterized for the physical properties or parameters; 3) one or more properties must be homogeneous within an individual source; 4) measurable, statistically valid differences between sources must exist for one or a combination of these parameters; and 5) they must be measurable using analytical methods appropriate [2, 3]. The process of taking compositional data and attributing a provenance from a certain source is not a trivial task . In order to determining the provenance origin, we used elaborations such as bivariate plots and source discrimination approach. For instance, in the obsidian study, bivariate plots of certain trace elements (e.g., La/Sc vs Cs/Sc, Eu vs Cs) appear to be sufficient for visual assignment of artefacts to individual island sources, at least in the Mediterranean . On the other hand, Neutron Activation Analysis introduces strong analytical advantages (described in Experimental section) but the presence of some possible interferences requires a special statistical treatment of the samples (i.e. source discrimination). Provenance studies are important for the knowledge of trading routes but in some cases they are not so easy to find this out, especially considering the multiple Sardinian sources . The recovery of some original tesserae allowed the identification of interesting materials. Among the different analytical methods successfully employed in archaeological provenance studies on many materials, the tesserae were examined initially using non-destructive analysis by X-Ray Fluorescence (XRF) and successively through Instrumental Neutron Activation Analysis (INAA). Although it is impossible using portable XRF in order to detect an accurate chemical composition of glass, nevertheless this technique allows, in an absolutely non-destructive way, recognizing and semi-quantitatively evaluating the presence of the chemical elements [5–7] related to the colouring agents and to the opacifiers of the vitreous mass. Table 1 shows the results of XRF analysis. The tesserae were found to be of two types: the first type relates tesserae obtained through a coloured glass (samples 1–11 and 15–17), the second type of tesserae has been obtained from a glass having a natural origin (obsidian) and they have been used for the black (samples 12–14). Antimony compounds, containing tin impurities, have been found as opacifiers of the vitreous mass. All the tesserae made of blue-green transparent glass (samples 1 to 5) and of a translucent blue glass (samples 6 to 10), without exception, have been coloured with copper compounds. The dark blue tessera (sample 11) is the only one to contain cobalt. Impurities usually associated with cobalt (As, Ni, Bi, In and Zn) were not found. The slight increase in manganese amounts, compared to other samples of glass, may be due to cobalt ore used. It could be asbolite, a mineral consisting of manganese oxides with high capacity of cobalt (20-30%). As white tesserae (sample 15) a highly homogeneous and compact limestone has been used. 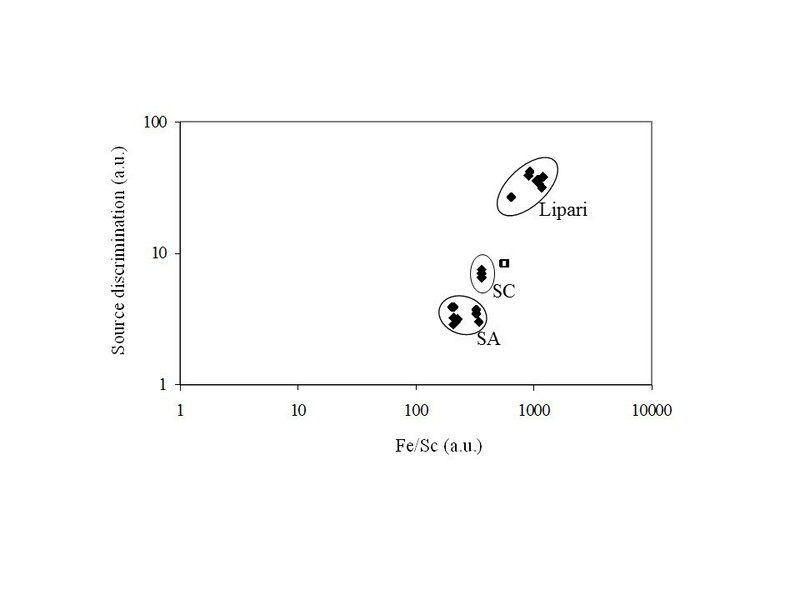 XRF analysis detected the presence of impurities of iron and manganese, while strontium, which is generally associated with calcium is absent. Colourless glass tesserae (samples 16 and 17) containing amounts of antimony can be in amount equal to half the amount found in other coloured tiles. It suggests that antimony compounds were used for decolouring the glass matrix, a well known technique for classic world, but not documented in Medieval glasses. The composition of trace elements determined by neutron activation analysis of obsidian was compared to those of other obsidians from known sites (Table 2). In particular, the works of Hallam et al. and Ammerman et al. were taken into account. On the basis of trace elements determined, it is possible to affirm that the source of the obsidian used as black tesserae in the mosaic of San Giovenale comes from Sardinia. To confirm this hypothesis the composition of the two samples was compared to obsidian samples of well-known geographical provenance to get information about the deposit areas and the route followed for shipping such material [10–14]. 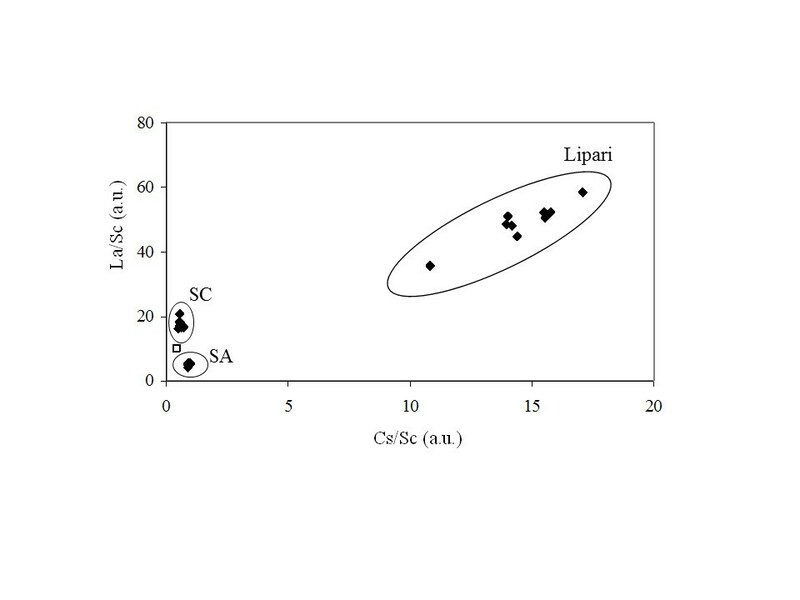 We analyzed and compared the samples with obsidian samples coming from the western Mediterranean area such as Sardinia (Arci Mountain, site A and C, SA and SC) and Sicily (Lipari). These areas can be considered as target for such materials. According to the information reported in literature [4, 8, 10, 12, 15–17], it is also possible to individuate the deposit sites of each obsidian samples by comparing the ratios of some elements, e.g. La/Sc vs Cs/Sc. 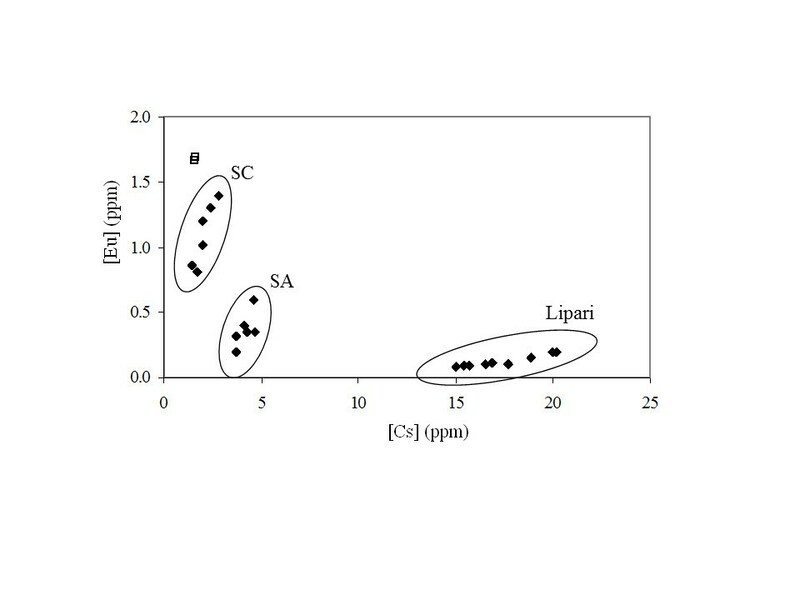 This plot is shown in Figure 2 describing that the samples used as standards make three well-separated groups (Sardinia A, SA, Sardinia C, SC, and Lipari). The two samples collected from the Narni Majestas, show a quite similar composition to those grouped in the SA and SC groups. Particularly, the ratios of the two samples are equidistant from the SA and SC groups. 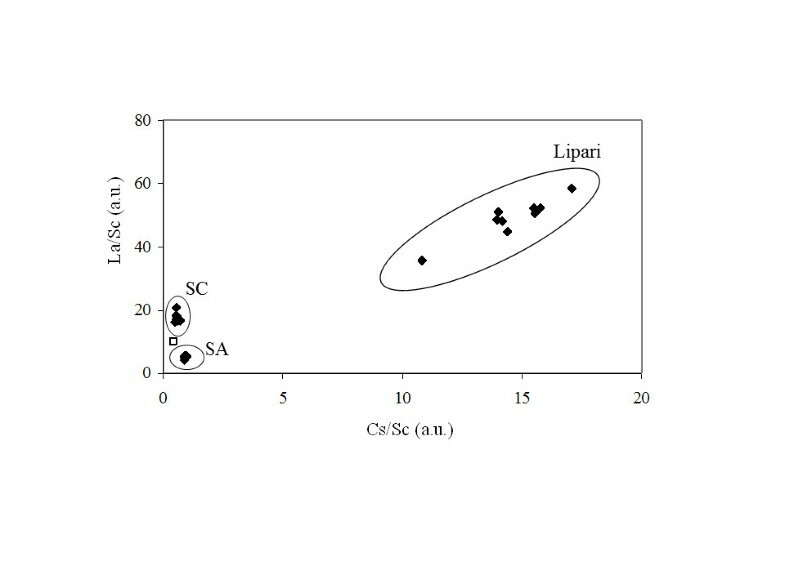 Attribution of the obsidian samples to the source groups by means of INAA on the basis of ratios of the contents of La and Sc and Cs and Sc. Attribution of the obsidian to the source groups by means of INAA on the basis of the contents of Eu and Cs. Multiple regression analysis: plot of the discrimination factor vs. Fe/Sc abundance ratio. Differently from other studies the elements Ce, Cs, La, Rb, Sc, Ta and Th, are sufficient to separate the obsidian samples from possible artefacts in different groups with high probability: in this case no artefacts are present neither in the samples neither in the obsidian standards (Figure 4). These two last elaborations allow to specify the provenience of the tesserae. In fact, even if in Figure 3 the three standard groups are quite different, the samples 12 and 14 are more closer to the Sardinia samples than to the Lipari ones. Again, the SC samples seems to show a composition more similar to our mosaic tesserae than to the SA samples. For all the reasons evidenced in Figures 2, 3, 4 the obsidian analyzed in the tesserae of the Narni mosaic can be attributed to Sardinia deposits and, in particular, Arci Mountain site C can be considered the main deposit. This is interesting from an historical point of view. In fact, the presence of obsidian in black tesserae could be explained by the difficulty of obtaining a black colour for the glasses. Moreover, there are indications that suggest the reuse of ancient colourless glass tesserae. Further, we showed the presence of antimony compounds for opaque or discoloured glass. The peripheral position of Narni and the resumption of the mosaic technique, after a hiatus of nearly two centuries, may explain the use of unusual materials. The distance between Narni and sites of possible supply of obsidian, is actually much greater than that which separated at that time Narni from centres of glass production. Taking into account that Narni is located in the valley of the Tiber, the route would have been more plausible one that leads to Rome, a distance of only 90 km. In this city, no doubt, black glass supply had certainly been easy. Moreover, the presence of obsidian was never found in Medieval mosaics in Rome. Every reason to believe that in the case of the mosaic of San Giovenale - at least in regard to the black tesserae (technically more difficult to obtain) - raw materials were reused collecting it from a nearby site. It is also possible that recycled material were used also for some glass tesserae, namely for those made with colourless and blue glass. In fact, in these tesserae the low presence of Mn (respect to Fe) and a noticeable presence of Sb seems to point out the use of Sb compounds to decolouring the glass matrix. Generally, this decolouring technique is associated to the very important and high quality glass products of the classical Antiquity, unknown in Occident after the fall of the Roman Empire: in fact, the use of Sb as decolouring has never been identified in Medieval European contests . Similarly, the absence of marker elements associated to cobalt used for colouring glass from the 13th century could point out the use of recycled blue glass or the persistence of the production of cobalt based blue coloured glass since the Antiquity; however, the fact that cobalt was used only for dark blue tesserae, while light blue tesserae were coloured with copper compounds seems to support the first hypothesis. The sampling was directly performed on the mosaic. In Table 3 lists the characteristics of each tessera examined and the type of analysis performed. We used an X-ray generator CPX-M160 Gilardoni and a planar Ge(HP) detector EG&G Ortec having resolution 195 eV at 5.9 keV. The distance between the tessera surface and the detector was 6.5 cm; the measurement time of each acquisition was 180 seconds. For each tessera two different operating conditions were applied. In the first one, which allows the detection of K, Ca, Mn, Fe, Co and Cu, the high-voltage at the filament of the X-ray generator was 20 kV and the current was 7.0 mA. In the second operating condition, allowing the detection of Pb, Sr, Zr, Nb, Sn, Sb, Ba, La and Ce, the voltage of the X-ray generator was 60 kV and the power of the current of X-ray generator was 4.0 mA, with a copper shield 0.5 mm thick inserted between the collimator and the X-ray tube, in order to attenuate the low energy component of the beam. Scientific methods of analysis have been used in archaeological provenance studies since long time. Over the last few decades, many diverse techniques have been applied to obsidian materials, from density measurements to Neutron Activation Analysis. We preferred to use this last technique for its analytical characteristics [3, 19–30]. In fact, the methodology improvements in sample handling, precision and accuracy, along with reduced sample size requirement, made the Neutron Activation Analysis appropriate for archaeological provenance studies . In Instrumental Neutron Activation Analysis (NAA), a sample is irradiated in neutron flux from a nuclear reactor. Upon irradiation different radionuclides are produced depending upon the nature of sample, the irradiation time and the neutron flux. Samples 12 and 14, of about 400 mg, along with blank and standards, put in nuclear-grade polyethene cylinders (Kartell, Milan, Italy), were irradiated under a neutron flux of 2.6×1012 n cm-2 s-1 in the rotating rack of the TRIGA Mark II reactor of the ENEA-Casaccia Laboratories. The flux stability (>99.8%) was tested irradiating Au standards as monitor. The high integrated flux, i.e. 1.8×1017 n cm-2, allowed to investigate elements whose gamma-emitting radionuclides have half-life time ranging between 0.5 day and 15 years [19–30]. After irradiation, γ-ray spectrometry measurements of different durations were carried out using a Ge(HP) EG&G Ortec (relative efficiency 29%, FWHM 1.70 keV at 1332 keV) connected to a multi-channel analyzer equipped with software packages (Canberra Genie 2k) for γ-spectrum analysis. Na, K, As, Sb, Br, Mo, La, Sm, Yb, W and U, elements characterized by gamma radioisotopes with half-lives ranging between 12 hours and 3 days, were determined performing measurements of 2 hrs-long after 7 days from the end of the irradiation; a second series of measurements (24 hrs-long) were performed after about 70 days from the end of the irradiation for determining elements showing radioisotopes with long half-life time such as Sc, Cr, Fe, Co, Ni, Zn, Se, Rb, Sr, Zr, Cs, Ba, Ce, Nd, Eu, Lu, Hf, Ta and Th. The analysis of reference materials is critical for all analytical techniques. Ideally, reference materials should be similar in composition to the samples of interest, since matrix effects occur for most analytical techniques. Our laboratory analyzes an in-house secondary reference material  to verify the instrumental drift and for quality control. For the analysis, primary and secondary standards were used. A mixture (1 mg mL-1 of each one) of primary standards (Carlo Erba, Milano, Italy) and secondary standards, such as USGS-GRX (United States Geochemical Survey) n. 1, n. 4 and n. 6, and Coal Fly Ash (NIST) n. 1633a were involved. Further, other different minerals of similar composition to the obsidian minerals were chosen as secondary materials, especially for comparing the provenience of the obsidian samples. The uncertainty of the methodology was tested measuring the secondary standards with solution of primary standards at different concentrations. All results were in agreement with the certified values except for Zn that is consistently lower due to the high 46Sc activation interfering with the 65Zn peak. In this case we used primary Zn standard for determining this element in the obsidian samples . Table 4 reports all the nuclear data [20, 32] and Limits of Detection (LODs) for the elements studied in this work. The possibility to employ XRF and INAA analyses allowed to solve an important analytical problem about the characterization of the tesserae from a mosaic in Narni chapel. The obtained information was useful for determining the provenance and, particularly, the origin of the obsidians whose the tesserae are composed. 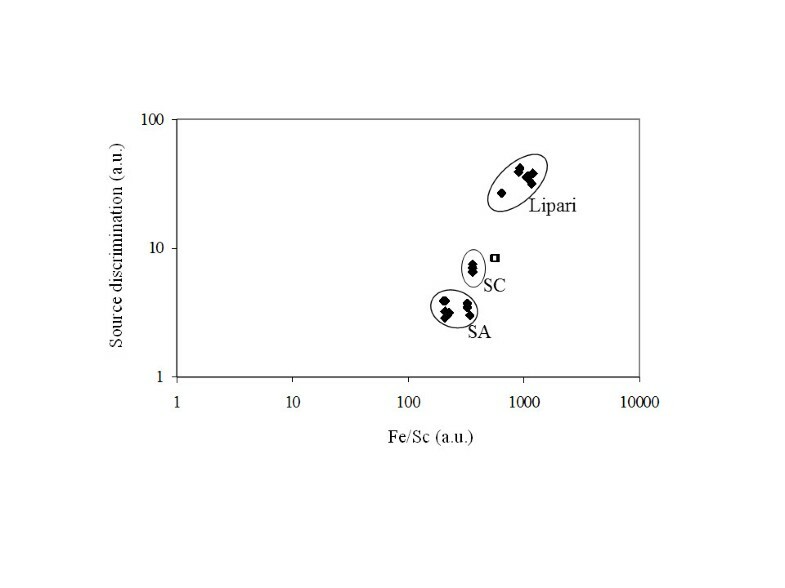 The elaborations performed comparing the selected elements content between our obsidian samples and obsidian samples of well-known provenance using different statistical approach (i.e., the La/Sc vs. Cs/Sc ratio, the correlation between Eu and Cs concentrations, the source discrimination), evidenced that the obsidian samples 12 and 14 come from the deposits in Sardinia (and, presumably, they could be related to Arci Mountain site C). Considering the presence of Sb in the chemical elemental composition of the glass tesserae, they can be considered as reused material in such mosaic, circumstance which could suggest, similarly, a reuse also for the obsidian black tesserae. This work was supported under the grant ISPESL/DIPIA/P06/L06 “Identificazione, analisi e valutazione delle conseguenze delle attività antropiche”, 2009–2012. CS coordinated the study. CS collected the tesserae during the sampling campaign. PA and AR set up and performed the analytical procedure by means of INAA, PM performed the XRF analyses. PA, AR and CS edited the text and prepared the final draft of the paper. All the authors have read and approved the final manuscript.